Discussion in 'General Trek Discussion' started by Red Panda, Aug 13, 2018. And what if CBS/Paramount decided to put cease and desists to anyone else who'se ever made a prognostication or opinion about their intellectual property that turned out to be wrong? There's very good reasons libel is hard to litigate. Unless they are for altogether made up words, trademarks are generally on the use of words *in a specific context*. Microsoft has a trademark on "Windows" in the context of computer operating systems - doesn't mean they can prevent a new company that sells glass windows from selling those as windows or calling their company "Bob's Windows". The name Cobblepot, in the real world, goes back hundreds of years, so it is a generic term, and DC has a copyright on the character and a trademark on the name in the context of that character (or at least I presume they have those). No one is reasonably going to confuse a 3D printer with their character, so a court would probably not uphold a complaint. Now, if you feel that they used the name on purpose to try to ride the coattails of the show, then that's up to you. But one man's IP theft is another man's homage, and I prefer to think the best of people until proven otherwise. Maybe the creators are just really big Batman/Penguin fans. OR, based on the design of most 3D printers, maybe it has more to do with the approximate pot shape and the fact that you can cobble things together with it, and the name has a good sound to it. 'Cobblebot', on its own, without the 'Cobblepot' association, doesn't make a whole lot of sense, because 'cobbled together' has the negative connotation of something having been assembled carelessly, sloppily, and in haste....something that you would not normally want people to have in mind when you are attempting to sell them a 3-D printer. There's a difference between opinions and lying. To say CBS doesn't have the rights to The Next Generation, so the new Picard show legally has to be a separate continuity, would be a lie - unless you're suggesting Midnight's Edge aren't lying? I watched their videos and I don't recall them ever saying that. 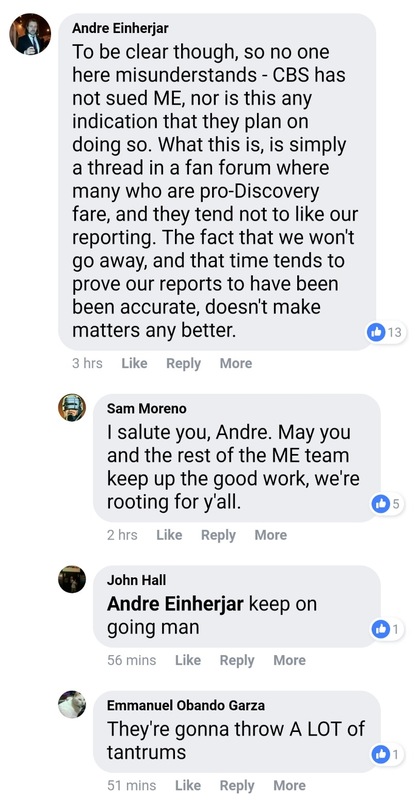 Could you post a time stamped link to that exact quote since you're so sure they're lying? People should just report their videos where ever they see them as spam, do the same on YouTube, they will soon vanish if you do that. Also the same goes for that DoomCock person, I mean WHO THE F**K names themselves that. I’ve been a forum member here for several years. I follow Midnight’s Edge. Apparently they are liars? Not sure why you care what a Youtube Channel posts that you don’t agree with, Red Panda, as there are thousands of them... But, let’s hear it. Make your case. The only people who take Midnight's Edge seriously are unplacatable cancerfans who need to be ignored anyway. I have yet to see anything accurate out of that channel and I just ignore it now, along with most of humanity. If monetizing inaccurate crap keeps the channel owner stocked with dinner, and he's not committing libel, none of my business. None of my business either way, really. 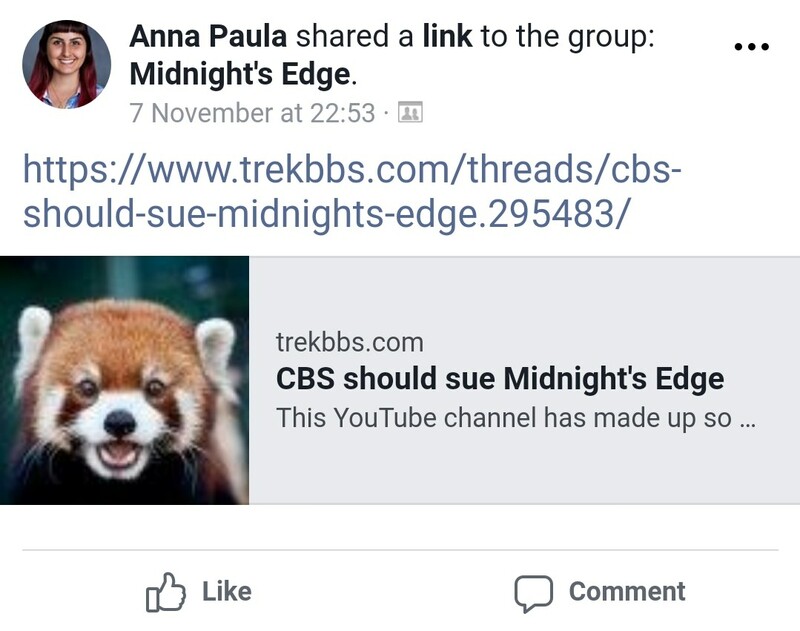 After stomping out Axanar, it would probably be a good idea for CBS to not take a YT channel to court. Axanar wasn't stomped out. It caused a fire that had to be put out, and ended up getting a lot of perfectly good people caught up as collateral damage. nightwind1 and Sgt_G like this. 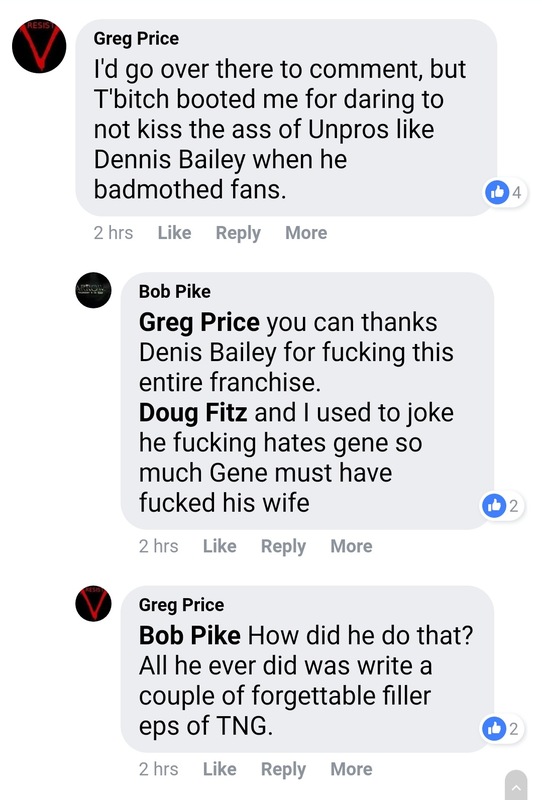 O/T - This "Denis Bailey" mentioned... is that the same banned Denis that is sometimes mentioned here? He's still here and posting as @Serveaux now. As far as this topic goes, Midnight's Edge is pure clickbait horseshit, but that's not grounds for a lawsuit, and it would be giving them undeserved attention. They're not even a fly in the CBS ointment, and certainly not worth the time. cultcross, Serveaux and Marynator like this. 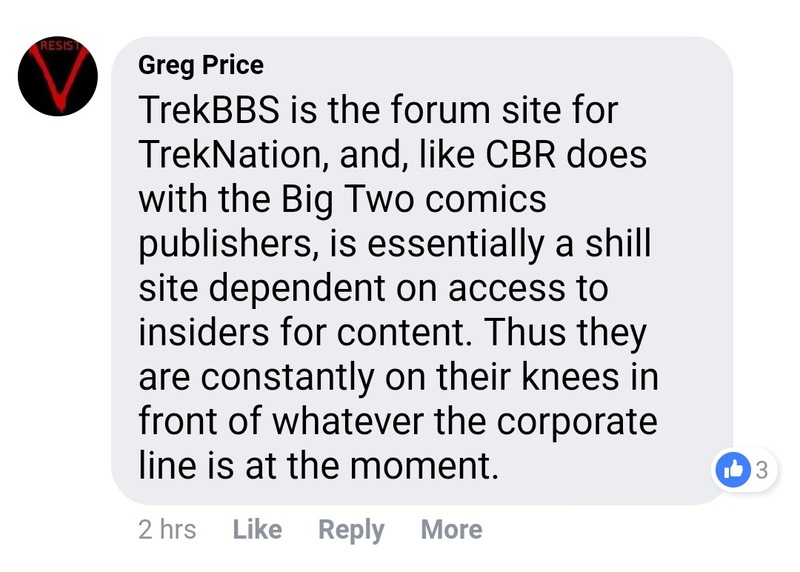 This thread didn't have much of a leg to stand on in the first place, and its suitability for GTD was even more questionable, as it's more about somebody's YouTube channel than Trek itself. We talked about them, now they're talking about us, and we're talking about them talking about us...after discussing with my co-mod, I'm happy to close the loop. nightwind1, fireproof78, CorporalCaptain and 2 others like this.